It sounds like an urban legend. A rumor, whispered at the lunch table. A factoid floated in an auditorium by a misinformed gym teacher. A forgettable footnote on a D.A.R.E. pamphlet. It's a punchline: Elaine Benes herself fell under the spell of poppy seed bagels, then flunked her drug screening as a result -- leading to some hilarious ‘90s laugh-track action. 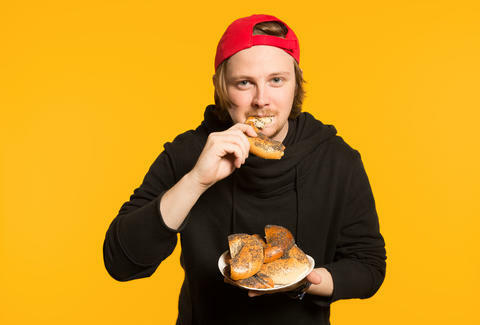 But it wouldn’t be funny if you lost your job because of your breakfast, would it? Research has shown that eating poppy seeds, which contain trace amounts of opioids, can in fact trigger positive drug results on standard urine tests. Always wary of "science," I decided to take matters into my own bladder to see if eating poppy seeds will actually cop a non-opium user (like me) a hot pee test in real life. The process was painful. It was bitter. And it left with me nothing but a bad taste in my mouth and a cup of urine in my hands. Kind of like D.A.R.E. assemblies in middle school, actually. But I learned something along the way: mainly, that it's extremely hard to eat poppy seeds in large quantities. And, if you think you are going to get drug tested in the near future, it's best stick to croissants. If you value your career path, at least. Let's get this out of the way: I had zero medical consultation over the course of my journey. Most studies out there are ambiguous on the specifics -- saying it is possible to trigger a positive test by eating poppy seeds, but that it is greatly dependent on variables like metabolism, and even type of poppy seed being ingested. Any doctor I would talk to would just refer to these studies, and regurgitate them, one way or another. This experiment wasn't about what doctors think would happen. This is about what actually does happen. I had the means to do this on my own. I did ask my girlfriend, a practicing physician assistant, if it was safe to eat thousands of poppy seeds. She said, "In my medical expertise, you are an idiot," and went back to watching Friends on her iPad. This was all the assurance I needed. I knew I was doing the right thing. Still, YOU SHOULDN'T DO THIS AT HOME. Eating large quantities of poppy seeds can make you sick. And I'd hate for you to get sick, dear reader. Especially during this time of year. 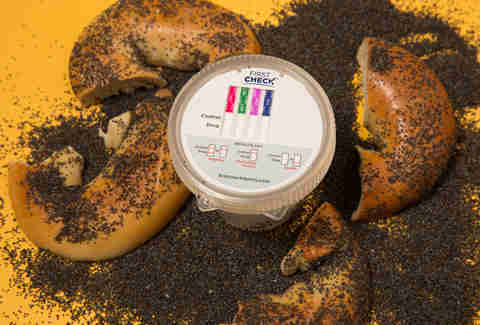 So, according to the guy who sells bagels at fancy New York market Dean & DeLuca, poppy seed bagels commonly have two teaspoons of poppy seeds in them. 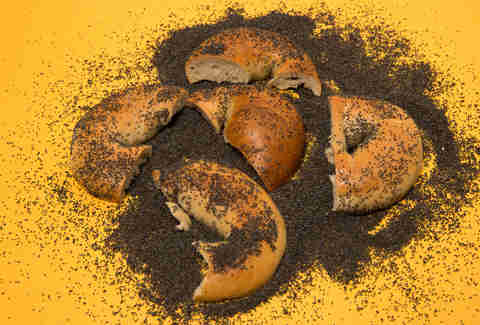 Naturally, I wanted to eat the equivalent of several bagels' worth of poppy seeds, to fully test my hypothesis. If you are going to do something, you might as well go dangerously overboard... as my grandfather would often say. But after putting on my lucky red hat and eating one bagel, I decided it was neither beneficial to my waistline, nor my state of well-being to eat any more. Plus, we were out of cream cheese. I needed a different way to consume a lot of poppy seeds. It was a unique situation for me, as I had never seen/heard of anyone who was actively trying to eat poppy seeds at a high clip. This was uncharted territory. I imagined myself as the Lewis and Clark of misguided Internet writers. It was a good feeling. I made my second move and bought poppy seeds in bulk, putting them in an artisanal Mason jar because I'm a white millennial and that's just the kind of stuff we do when our backs are up against the wall. Remembering my favorite part of Mary Poppins ("a spoonful of poppy seeds makes the medicine go down"), I grabbed my Mason jar and the spoon I always carry in my back pocket, then went wrist-deep in seeds. That's when I realized two crucial things: I had never actually seen Mary Poppins, and I had made a monumental mistake in my mouth. I coughed and gagged and fell to my knees in instant regret -- when it was all over, I felt like I had spent a fortnight at Señor Frog's, with the lights on. Unattached to an assorted baked good, poppy seeds taste like dirt-flavored Dippin' Dots™. They are bitter and stick to the back of your throat. Flashbacks of the cinnamon challenge danced in my head. I could not raw-dog this one. And I hardly ever say that. Trust me. While I was draining my glass of standby water, trying to clear the poppy seed blockage lacing my windpipe, I had an idea: I'd mix the seeds with water and drink it! 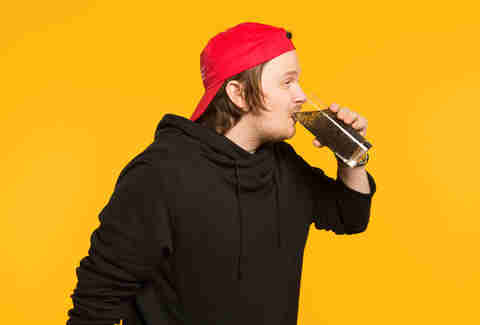 I've always had major luck trying to drink my problems away in the past, maybe it would work again? OK -- it did work. This was definitely easier than eating these things raw, and less filling than eating a bunch of bagels. Plus, I know you should drink eight glasses of water a day, and I only had seven so far that day. 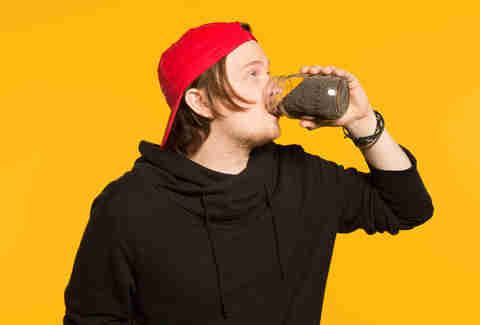 That glass looks gross, right? That's because it WAS gross. But it did the trick. I had consumed several thousand poppy seeds -- roughly the equivalent of four to six bagels' worth. I was finally finished with my training, and ready to get back into the ring to face my rival, Apollo Creed. But first, I had to take this drug test and finish writing the article about it. 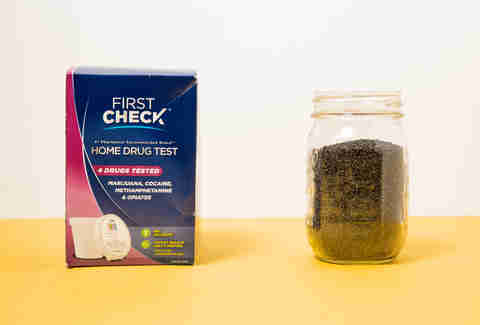 Having a very involved and concerned mother, I had some familiarity with at-home drug tests. For starters, they're 99% as effective as lab tests! In other words, if you pee hot in one of these things, you'll definitely show up positive in a more invasive lab test (the kind your employer or probation officer would probably deploy). And you get your results in minutes. How convenient. Two hours after eating my seeds, I went to the office bathroom when no one was looking, and peed into a cup. Now, this isn't totally irregular for me, but usually I just dump the cup in the sink instead of taking it out of the bathroom and into an empty conference room to await the results. After 10 minutes, the results were in: I was opiate free. I'm not going to lie, I was a little disappointed. For once in my life, I was incredibly distressed about passing a drug test. I know it shouldn't matter, but for some reason, I wanted to test positive. I went home in a foul mood -- still picking seeds out of my teeth and sensing the bitter remnants of defeat on my tongue (or maybe I was still tasting the thousands of poppy seeds I just ate?). When I got home, I told my girlfriend what had happened. She suggested I try testing myself again, as sometimes these things take a little while, in her esteemed medical opinion. I went to the drug store and got another drug test -- and chugged some more poppy water, just in case. As I readied myself over the cup, I somehow knew this time was different. Maybe it was something in the air. Maybe it was my girlfriend's voice, demanding that I "at least do this in the bathroom, and not in the lobby of our building in front of all these people." Maybe it was just woman's intuition that I think I somehow gained by eating thousands of poppy seeds. Whatever it was, when the piss settled and the test was ready for a gander, I knew that little red line would be absent from the "Opioid" section -- signaling a positive test. Lo and behold: I had done it. I was positive for opium. I spent the rest of the weekend reflecting on my successful experiment, while kicking back and smoking piles and piles of actual opium -- because if I was already testing dirty, I might as well enjoy the real thing right? Maybe with a bagel. A sesame seed bagel. 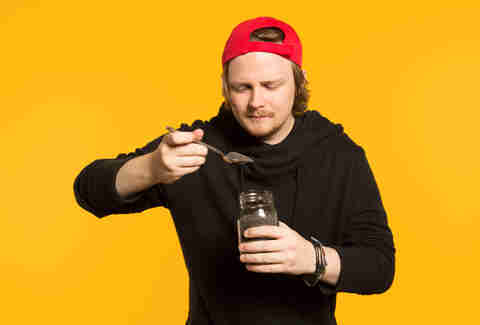 Wil Fulton is a Staff Writer for Thrillist. He'll never eat a poppy seed again. Follow him @wilfulton.